This basic library provided client web service and graphics to follow specifical values in web pages. Extracts a value in a web page. Returns error-value if value not found or internet connection failed. To find appropriate parameters, visualize position of searched value. 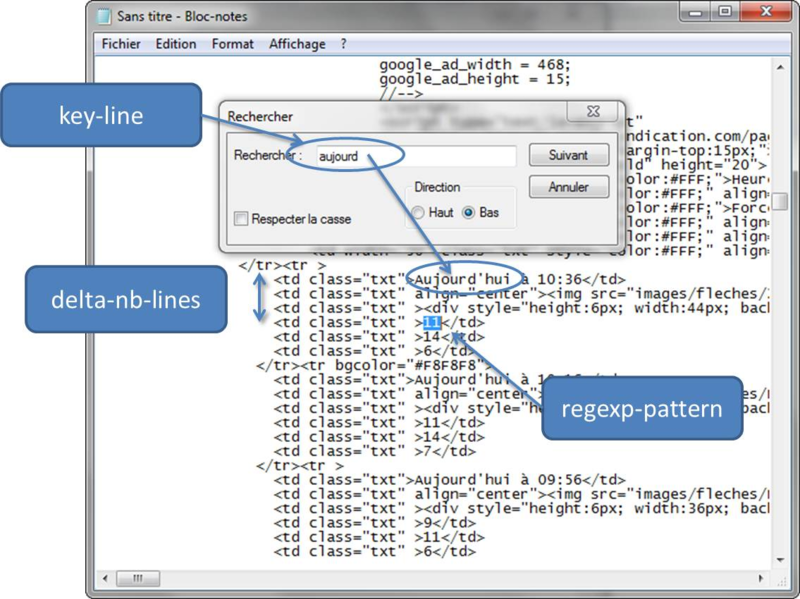 Search a word to locate a reference line (key-line parameter). In the example, we choose "Aujourd" for the key-line word with delta-nb-lines = 3 to jump to velocity wind value. The value is an integer, therefore regexp-pattern parameter is "[0-9]+". Returns wind velocity read as an integer on winds-up web site at 3 lines after that containing "Aujourd" word. Otherwise returns -1. Graphic evolution of value in web page. > (live-graph "Water level (m)"
This function displays graphics in rows and columns disposition. Each sublist is a row. (pressure "Paris") and (pressure "Marseille") will be called every 15 minutes. Data displayed in graphs can be saved in real time in a database. For this you can use new-value-event parameter with insert-into-db procedure. (insert-into-db db label seconds value) → void?